1 Pioneer S-DJ50X package available. DJkit introduces the active reference speaker the Pioneer S-DJ50X Monitors designed specially for DJs who want to practice at home but with high quality sound. They are perfect for DJs who want to achieve the highest accuracy in sound reproduction with improved bass response, built in equalization and three types of inputs. Building upon previous models, the S-DJ50X’s audio quality is maximised as the speaker uses extremely rigid medium density fibreboard for its enclosure and its 5-inch woofers are constructed with aramid fibre cones to produce a robust base. These construction features allow for you to practise mash-ups and reedits with a punchy kick that can be achieved at any volume. 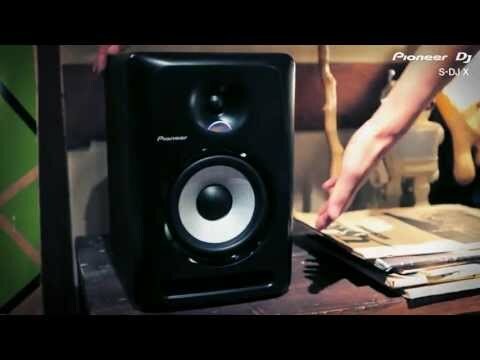 If that was not enough, to improve airflow the Pioneer S-DJ50X Monitors introduced groove technology onto the porthole. The grooves direct the sound waves with less air friction so your beats sound smooth and powerful. With the help of the new convex diffuser, the Pioneer S-DJ50X speakers allow sound to spread further than previous models. Improving the directivity of high frequencies to ensure you can achieve a 3D stereo sound. DJkit believe its important that the Pioneer S-DJ50X allow you to gain more control over your sound production through the built in equalizer controls. These allow you to adjust output via the built in equalizer from the back of the speaker by one-decibel increments, meaning the sound is personalized to your hearing tastes. If that was not enough, the speakers include an auto ON and an Auto standby mode whereby after 25 minutes of no input signal they turn themselves off. This is not only for power conservation, but for convenience as there is no need to fiddle with the back of the speaker to find the on and off switch. Perfecting the hassle free set up is the arc shaped power light to show you clearly when the speaker is on. Each speaker is sold separately with no link up between the two speakers. The speakers are attractive to the eye in either black or white colouring. The pure speaker is a fraction of the cost of a studio monitor making it the perfect speaker for in room practice. Considering purchasing the Pioneer S-DJ50X? Have questions? Ask people who've recently bought one. Hi I want to buy the S-DJ50X and the DDJ-RB Controller. Which cable do I need to connect those? Would be nice if you could link it as I still get confused about all the plugs. Cheers. Do you own the Pioneer S-DJ50X? Why not write a review based on your experience with it. I already had one so it was only a matter of time before I made it into a pair! Excellent monitor for home use and as monitor at gigs. The usual excellent service from the crew at DJKIT.COM. purchased these with a DDJ-SX2 and the sound quality and bass are amazing, great purchase from DJKIT. Excellent sound quality, great range for my particular needs, easy decision to choose these to go with my Pioneer XDJ/DJM set up made simpler by the help DJkit staff gave when looking through my options. 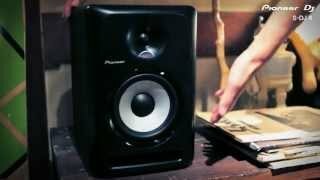 Seen a video for Pioneer S-DJ50X online or have you own video? Check out Pioneer S-DJ50X on DJkit.com!